Bristlebots were the first inventions to come to life, with teachers creating tiny robots from a vibration motor and cell battery – a seemingly simple activity that sparked a host of design variations. The group then began a makerspace round robin, having dedicated time to create music with MaKey MaKey, program in Scratch and Scratch Jr., and create their own eBooks using the iPad/Android app Book Creator. But by far the most engaging session of the day was the littleBits robotics challenge. 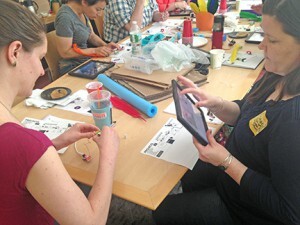 Teachers were given access to a wide variety of littleBits components, recyclables, and art materials and challenged to create a sculpture or robot that moved and make sounds. The group divided into pairs and displayed a wide variety of design thinking. 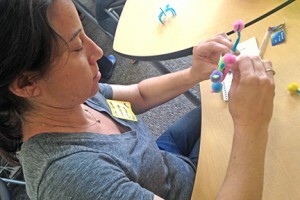 From tickle machines to kinetic sculptures, the teachers really found their groove in this open-ended challenge. When asked what they got out of the day, one teacher commented: “It really made me think out of the box more on how to incorporate STEAM into my curriculum.” While acknowledging that not all teachers have access to a large budget, the group was also encouraged by the chance to see how to use every day materials and objects to foster creative learning.